Thomas Martin Dumont (born January 11, 1968) is an American guitarist and producer. Dumont is a member of third wave ska band No Doubt, and during the band's hiatus, he began Invincible Overlord as a side project and produced Matt Costa's Songs We Sing. Born in Los Angeles, California, the Dumont family lived in Irvine, California. Tom was the only adopted child in his family and has two siblings. Dumont's father, who played the piano, gave his son a guitar at age twelve. Dumont practiced by strumming folk songs by the likes of James Taylor. Dumont was influenced by heavy metal bands such as Iron Maiden, Judas Priest and KISS. He joined his older sister's heavy metal band Rising, but left in 1988 for third wave ska band No Doubt. He has one sister named Gina and a brother named John. Dumont studied music theory for five semesters at Orange Coast College. When the band moved into a house on Beacon Avenue in Anaheim, he wrote a poem about being addicted to television. He took the poem to Eric Stefani, who put the poem to music and came up with the song "Trapped in a Box". The song was recorded for the band's self-titled debut album and was the album's only single. The band later self-released The Beacon Street Collection in March 1995. The same month, Dumont left his job as a file clerk at a mortgage company. He had "a good feeling" about having finished recording Tragic Kingdom and planned to fall back on promoting rock concerts if the album was not successful. Tragic Kingdom became a commercial success, certified diamond in the United States and selling sixteen million copies worldwide. 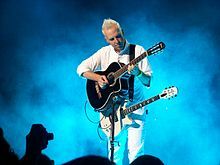 When Eric left the band Tom, along with bandmates Gwen Stefani and Tony Kanal, took leadership in writing and composing responsibilities. After the Tragic Kingdom tour, Tom returned to his home in Long Beach, California and started surfing in 1997. Dumont is a member of The Surfrider Foundation, an environmental organization to preserve coastal life. Since Eric Stefani left, Tom Dumont, Tony Kanal and Gwen Stefani became No Doubt's primary songwriters. During No Doubt's hiatus, Dumont produced Matt Costa's 2005 debut album, titled Songs We Sing, after hearing a demo tape by Costa. 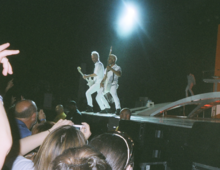 Dumont, along with Tony Kanal, during No Doubt's 2009 summer reunion tour. Manager Jim Guerinot said the yet-untitled album is being produced by Mark "Spike" Stent, who helped produce and mix Rock Steady. Between Stefani's pregnancy and recording, No Doubt did not tour in 2008, but Guerinot promised, they plan to hit the road hard in 2009 for their first full-fledged band tour in nearly five years. No Doubt announced on their official website that they will tour in the summer of 2009 with Paramore, The Sounds, Janelle Monáe, Bedouin Soundclash, Katy Perry, and Panic! at the Disco. while finishing their upcoming album, which was set to be released in 2010 but has been delayed. Tickets for the tour went on sale March 7, 2009. As a special promotion for the tour, the band is giving away their entire music catalog free as a digital download with purchase of top tier seating. In 2009, No Doubt made an appearance on the television series Gossip Girl, playing a fictional band called "Snowed Out" in the episode "Valley Girls". They performed their cover version of the Adam and the Ants song "Stand and Deliver". Dumont and his wife Mieke have three sons together: Ace Joseph Dumont, born April 6, 2006, Rio Atticus Dumont, born June 18, 2008, and Koa Thomas Dumont, born February 19, 2011. According to the band's record label representative, the couple was married in October 2004. 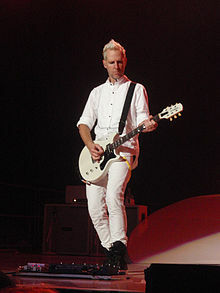 According to his No Doubt band mates, when Dumont drinks alcohol he becomes an alter-ego doppelganger named "The Douche". Dumont is an avid traveler, spending a good part of his free time on the road, he has been spotted in remote areas of the world with his wife and kids. Dumont is endorsed by discontinued Hamer Guitars and favors vintage MXR effect pedals. During live performances, he uses Kemper modeling amplifiers, but has also used Divided by Thirteen, Soldano, Vox, Matchless, Fender, and Silvertone amplifiers while recording. Divided by 13 4x12 Cabinets equipped with 16ohm Celestion G12M Greenbacks. ^ Strauss, Neil. "No Doubt's Anniversary Party". Rolling Stone. January 31, 2002. Retrieved April 14, 2007. ^ a b "Tom Dumont". TV.com. Retrieved January 18, 2007. ^ Bush, John. "No Doubt > Biography". Allmusic. Retrieved January 18, 2007. ^ Kam, Nadine. "No doubt about it". Honolulu Star-Bulletin. April 30, 1998. Retrieved September 13, 2007. ^ "Linkin Park Moves Two Steps Closer". Recording Industry Association of America. Retrieved July 1, 2007. ^ Van Meter, Jonathan. "The First Lady of Rock". Vogue (April 2004). Retrieved from Style.com April 16, 2007. ^ Murphy, Chelsea. "Faces in the Line-Up". Making Waves. The Surfrider Foundation. October 2003: Volume 19, Number 5. Retrieved January 19, 2007. ^ Atizado, Roy. "Interview with Matt Costa". NowOnTour. Retrieved January 19, 2007. ^ Vineyard, Jennifer and Richard, Yasmine. "No Doubt — Minus Gwen — In Early Stages Of New Album". MTV News. May 12, 2006. Retrieved December 19, 2006. ^ Cohen, Jonathan. "Stefani: No Timetable For No Doubt Reunion". Billboard. December 12, 2006. Retrieved December 31, 2006. ^ "Gwen Stefani Says No Doubt Are In The Studio 'Every Day,' Working On Album Expected In 2009". MTV.com. 2008. Retrieved April 1, 2008. ^ "2009 Tour". NoDoubt.com. 2008. Retrieved November 22, 2008. ^ "News : No Doubt Announces 2009 Summer Tour". No Doubt. Retrieved 2011-07-07. ^ "News : Tour Dates Announced!". No Doubt. Archived from the original on 2013-02-16. Retrieved 2011-07-07. ^ "News : Receive No Doubt's Entire Digital Catalog For Free With Online Ticket Purchase". No Doubt. Retrieved 2011-07-07. ^ "News : Gossip Girl Appearance Announced!". No Doubt. 2009-02-26. Archived from the original on 2011-07-14. Retrieved 2011-07-07. ^ Vena, Jocelyn (2009-03-17). "No Doubt Say They 'All Agreed' On 'Gossip Girl' Song - Music, Celebrity, Artist News". MTV. Retrieved 2011-07-07. ^ "No Doubt's Anniversary Party". Rolling Stone. January 31, 2002. ^ "Hamer News". Hamer Guitars. 2003-11-12. Retrieved 2011-07-07. ^ "Interviews - Guitar Center". Gc.guitarcenter.com. Retrieved 2011-07-07. ^ "Tom Dumont | Tom's fan site". Freewebs.com. Retrieved 2011-07-07.